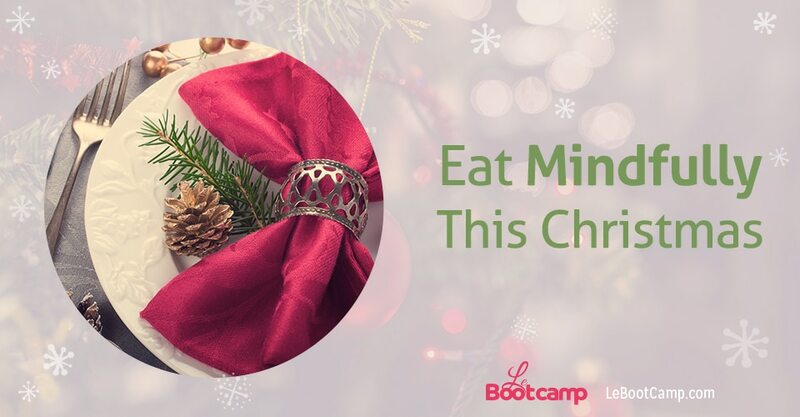 My #1 advice to my bootcampers during the holiday season is to eat mindfully. To be in a state of total awareness during every holiday meal. The idea is to not get carried away by the euphoria of the meal with family or friends which can sometimes last all day (or several days! ), where we taste tons of different dishes and always have a good excuse to take another appetizer, a little more chocolate, a little more wine. The goal of conscious eating is not to restrict or ban certain dishes, but to truly enjoy and have fun by eating everything mindfully. Savor. Taste. Take your time. Pay mindful attention to sensations of hunger and satiety. Eat only when you are at the table. When you consciously associate eating with sitting at a table, you’ll avoid mindless nibbling while preparing a holiday meal, and chocolates or sweets typically unaccounted for when you visit family and friends :). Involve all your senses. Once you’re sitting at the table, start by taking a deep breath, and pause to observe the various dishes: their colors, shapes and forms, what you want most. Once you’ve filled your plate, pay close attention to the scents, textures and flavors. Did you know that the digestive process has already started at this stage, secreting enzymes triggered by sight, smell and touch? Take your time. As you often hear me say, it takes approximately 20 minutes for the full range of satiety signals to reach your brain. So, if you’ve been eating for less than 20 minutes, a feeling of plenitude has not yet been able to arrive to the brain and you will continue eating when you may not actually need any more food! Chew and swallow one mouthful before taking another bite. Put your fork down in between. Take it slow. Savor each bite. Enjoy what you’re eating. Notice the texture of the food. Notice the flavors. Notice what your body is telling you about these foods. Feel the sensation of chewing, swallowing, and digesting. Let the flavors tantalize your taste buds. Relax when you eat. Allow your body to de-stress. Notice how good it is to share the holiday season with your friends or family. Pay attention to your body’s messages. After a heavy meal, our body quickly lets us know when it does not need to be fed again. 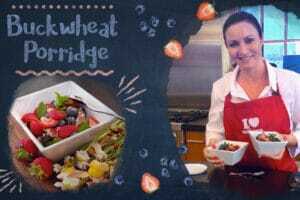 So don’t force yourself to have breakfast for example – or dinner on the evening after a heavy holiday lunch! Learn how to listen to your body and give it what it’s truly asking for. Indeed, after our bodies have consumed foods higher in fat and sugar, they generally ask for more fresh fruits and vegetables! Learn how to listen. Not yet a member of my program and want me by your side for the New Year? Sign up to LeBootCamp and get personalized coaching + unlimited questions to a coach 24/7!